Sheherazade and King Shahryar are the central characters of 'A Thousand And One Nights', also known as 'Arabian Nights'. The Persian King Shahryar, discovered that his wife was unfaithful and had her executed. But, the king was so enraged he determined to seek vengeance on all women. Each day, Shahryar married a young woman, spend the night with her, and had her beheaded in the morning. Eventually, he married Sheherazade, the beautiful daughter of his vizier. She shrewdly determined how to escape the executioner. During their wedding night Sheherazade told the king an intriguing story, only to stop near dawn, leaving the ending unfinished. 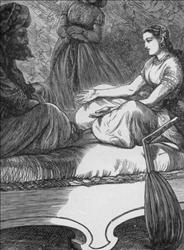 Anxious to hear the end of the story, Shahryar reluctantly spared Sheherazade's life for another night. But as soon as the first tale was finished, Sheharazade began another, again stopping just before the climax. She told story after story for one thousand and one nights. By then, Shahryar had fallen in love. He and Sheherazade lived happily from then on. 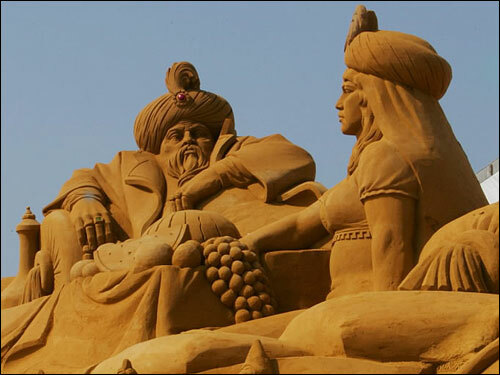 This amazing sculpture of Sheherazade and King Shahryar is from a Belgian sand sculpture competition!